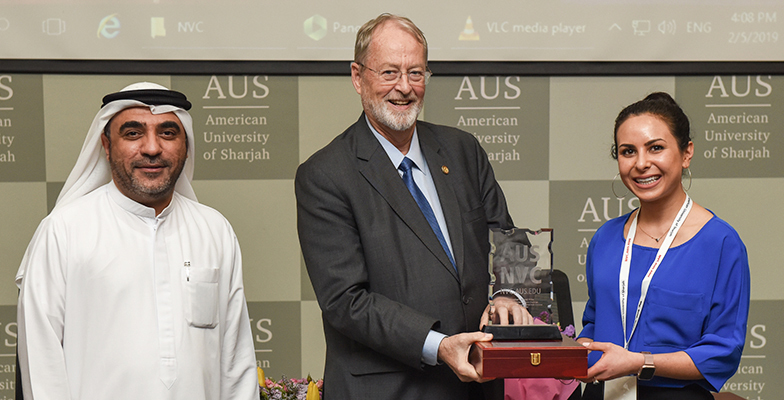 Neutroelectric LLC., from Dartmouth College has taken out the largest cash prize—the Chancellor’s Award of US$50,000—in the American University of Sharjah New Venture Challenge (AUS NVC). 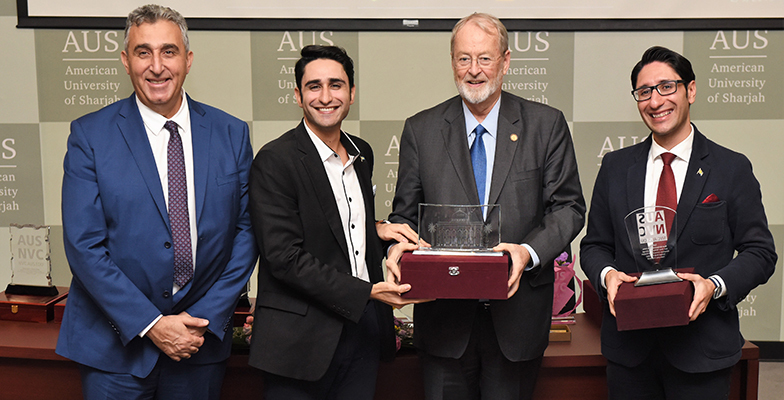 The announcement was made at a special awards ceremony held at AUS yesterday, February 5, 2019. The ceremony was the culmination of three days of intensive competition between the 17 semi-finalists of the AUS NVC, with numerous other teams also winning cash prizes that will assist in the commercialization of their hard science innovation. HEARTSTRINGS, representing the KTH Royal Institute of Technology from Sweden, won the $25,000 Sharjah Research, Technology and Innovation 1st Runner-up Prize. The AUS NVC invited teams of entrepreneurial graduates (or recent graduates) from universities around the world to submit a hard science-oriented innovation, entering the running to share in over US$200,000 worth of prizes, and the opportunity to pitch their idea to angel investors and venture capitalists. The challenge received more than 100 applications, with the semi-finalist teams hailing from some of the world’s most renowned universities. The finalists’ innovations included technologies covering a diverse range of science and engineering fields, including biomedical sciences, artificial intelligence, robotics and mechanical engineering, among others. The winning team, Neutroelectric LLC., is a radiation shielding materials company that has developed a high temperature neutron shield to improve safety and reduce costs of the nuclear industry, while Heartstrings was recognized for being the world’s first clinically-validated technology which uses Artificial Intelligence for screening and early diagnosis of heart disease. Chancellor’s Award of $50,000 was awarded to Neutroelectric LLC from Dartmouth College, USA. Sharjah Research, Technology and Innovation Park 1st Runner up Prize of $25,000 was awarded to HEARTSTRINGS from KTH Royal Institute of Technology, Sweden. SEWA 2nd Runner up Prize of $15,000 was awarded to NanoXCell Therapeutics from the University of Pennsylvania, USA. Sharjah National Oil Corporation Prize of $10,000 was awarded to Aerospec Technologies from Northwestern University, USA. Sharjah Chamber of Commerce and Industry Prize of $10,000 was awarded to Grid Fruit from Carnegie Mellon University, USA. Khatib and Alami Prize of $10,000 was awarded to Predictim from University of California-Berkeley, USA. HTC—International Innovation Prize of $12,000 was awarded to Synergic Medical Technologies, Inc. from University of Oregon, USA. HTC—International Innovation Prize—1st Runner up of $4,000 was awarded to i-ventus from Deggendorf University of Applied Science, Germany. Electric Way Prize for Sustainability of $10,000 was awarded to akyas from University of Jordan, Jordan. Khatib and Alami Prize of $8,000 was awarded to NABACO from Texas State University, USA. Coolest Technology Award of $4,000 was awarded to Beijing Thorgene, Ltd., from Peking Union Medical College, China. Zyfra Best 60 Sec Pitch Prize of $4,000 was awarded to HEARTSTRINGS from KTH Royal Institute of Technology, Sweden. Zyfra People’s Choice 60 Sec Pitch Prize of $2,000 was awarded to HEARTSTRINGS from KTH Royal Institute of Technology, Sweden. Khatib and Alami Best Exhibit Prize of $4,000 was awarded to Kosmic Energy, Inc., from Texas State University, USA. Zyfra Best Best Business Plan Presentation Prize of $6,000 was awarded to WCB Robotics Inc., from Birla Institute of Science and Technology, India. Zyfra Best Business Plan of $6,000 was awarded to Grox Industries, LLC., from University of Arkansas, USA. SEWA Semi-final Prize Awards of $4,000 to Cooling Watch from American University of Sharjah, UAE; Smart Hydrogen Stars from Murdoch University, Australia; and DAP Genomics from Istanbul Kultural University, Turkey. The NVC was sponsored by local and international companies and organizations which include Khatib and Alami; Sharjah Chamber of Commerce and Industry; Sharjah National Oil Corporation; Sharjah Research, Technology and Innovation Park; Sharjah Electricity and Water Authority; Houston Technology Center-International; Zyfra ; American University of Sharjah; Electric Way; and Kanaan Advocates and Legal Consultants.